Grades k-8 – Mondays 4:00 – 5:30 p.m.
Spring registration is now open for grades k – 8 to be a part of Setting the Stage’s next production–Disney’s Cinderella Kids. Mondays 4:00 – 5:30 p.m.
Run Through at Harper College: May 21* 6:00-8:00 p.m. Dress Rehearsal at Harper College: May 28* 6:00-8:00 p.m. Performance at Harper College: June 1 10:00 a.m. 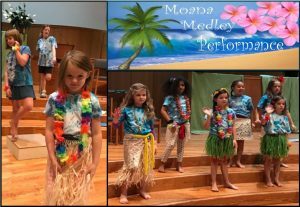 The Moana Medley kids put on a fabulous show for the congregation on Sunday, August 5. After their week-long bootcamp session with Setting the Stage, they were pumped and ready to perform. And their talent, energy, and spirit shone through! Hard work + dedication = success for this great bunch of kids!